I was given another glimpse into just how powerful art journaling can be last night. I had an idea for Put it on Paper, something that I had rolled around in my brain once before and pushed off as not possible and not a very good idea at the time, but I’d made note of it in my art journals, made some doodles and wrote it down. I quickly flipped through the last 2 journals where I knew the info to be, tabbed those pages with a little Post it flag, and then used my iPoo Touch to snap some pics, shelved the books and took the info with me, in my pocket. I sketched out a quick idea in my art journal of what I thought this idea could look like and emailed it to Jane. As I relaxed into bed, I reviewed the pages on my iPoo and made some fresh notes and doodles about the content of the proposal. How amazing is it that I can carry 4 journal’s worth of info in my pocket? I read somewhere that someone scanned their notebook pages into their computer and used a specific program to make them searchable. How cool is that? 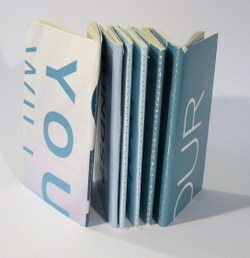 This entry was posted in Inspiration, Journaling and tagged art, cahier, gtd, jotter, journal, moleskine., notebook on 20120514 by leslie. 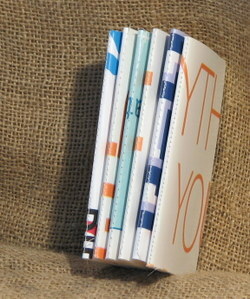 I just finished listing 8 new sets of jotters to etsy. 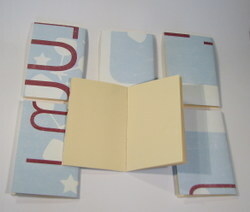 Each has 6 jotter notebooks in the set. 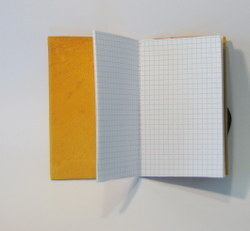 I have 3 different styles 100% recycled, Graph Paper and Wausau Ivory paper. Each se tis unique and one of a kind, as the covers are made from recycled materials- old advertising posters from a major retail establishment, cut up so that they no loner look like ads, just abstract designs. A few have letters and words on them, you’ll have to head over to etsy and see them. 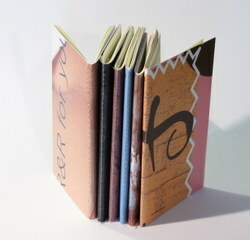 This entry was posted in Uncategorized and tagged book, cahier, handbound, handmade, jotter on 20071202 by leslie. 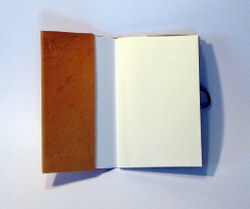 This is a leather jotter or moleskine cahier cover. 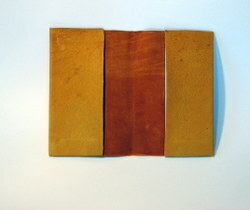 Golden yellow distressed sheep hide, smooth texture. Elastic closure. 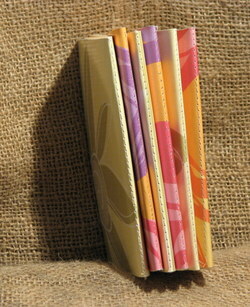 Jotters slip into the cover and slip out when you want them to. This is a one f a kind item I’m not intending to make more. One off for a friend of my mother as a Christmas gift. 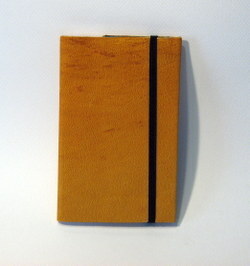 This entry was posted in Uncategorized and tagged cahier, cover, handmade, jotter, leather, moleskine. on 20071201 by leslie. I love getting emails like that. First it tels me I’m doing something right with my books and tells me that I’m not the only one who uses my little notebooks regularly. OKay so I use it like I’m addicted to it, but I’m okay with that. But maybe in a different color. 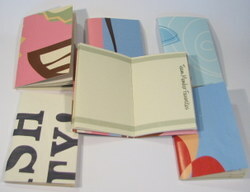 This entry was posted in Uncategorized and tagged cahier, handmade, handound, jotter, notebook, sketchbook on 20071022 by leslie. 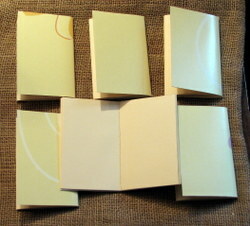 I just loaded this set of 6 jotters up to eBay. 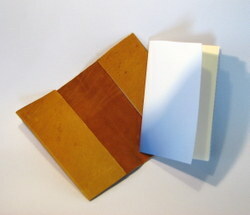 Each has 48 pages made of Wausau pastels 24lb paper in ivory color. The covers are made from advertising posters that are coated in vinyl. These posters advertised Easter dinners. The colors are pale yellow, pinks and some light green. Low starting bid and a low buy it now price. Made 100% by hand. 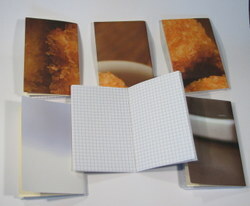 This entry was posted in Uncategorized and tagged cahier, diary, ebay, handmade, jotter, journal, notebook on 20071008 by leslie. perfectly in a back pocket and form fit to you. lists, things I need to do at work as well as notes for blog entries and big ideas. 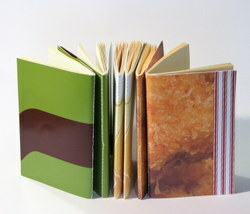 This entry was posted in Uncategorized and tagged art, binding, book, cahier, ebay, handmade, jotter, journal, moleskine., notebook on 20071002 by leslie.